Yesterday’s post got me thinking about more aspects of population and metropolitan areas. I decided to examine the relationship between the population of metropolitan areas and the population of each area’s core city. Basically, I wanted to know how Salt Lake City‘s population of 189,314 comprising only 8.1% of the Salt Lake City metropolitan area’s population of 2,350,274 ranks among other metropolitan areas. I put together the following table of metropolitan areas exceeding a half million in population and figured out how much of their populations were comprised of their core cities. Some core cities, like Colorado Springs, El Paso, San Antonio, and Corpus Christi comprise more than 60% of their metropolitan area populations. Surprisingly though were some of the cities on the other end of the spectrum. Atlanta, Miami, and Boston each comprise smaller portions of their metropolitan areas than does Salt Lake City. This entry was posted in Land Use, New Urbanism, Transportation on July 26, 2013 by Mike Christensen. I’m writing this in response to a tweet by Brad Bartholomew, candidate for City Council District 1 in Salt Lake City. I found out at a meeting today that people view #SLC in the same catagory as Alberquerque. No offense, but that hurts. I’m actually surprised that Salt Lake City was regarded in a category as high as Albuquerque. Often people use the wrong demographic methods when trying to formulate some kind of ranking. As far as population within city limits goes, Salt Lake City is a mere 189,314 compared to Albuquerque’s 555,417. On a list of US cities ranked by population, this places Albuquerque as number 32, while Salt Lake City is way down the list at number 124. Unfortunately, many so-called experts inappropriately use this type of ranking when making comparisons. This entry was posted in Land Use, New Urbanism, Transportation on July 25, 2013 by Mike Christensen. This entry was posted in Land Use, New Urbanism, Transportation on July 24, 2013 by Mike Christensen. I serve on the University of Utah‘s Parking and Transportation Advisory Committee. We met today to decide on a proposal to increase parking fees at metered parking spaces and at pay lots, where drivers pay by the hour. The problem is there is not enough parking available on campus for visitors. A large part of the problem is that too many students and employees, who despite having permits for the permit lots, are choosing to pay to park in visitor lots as it is cheap and convenient to campus. As explained by Alma Allred, Director of Commuter Services, there are three conflicting dimensions to parking: cheap, convenient, plentiful. If parking is in demand, only two of the three can ever be satisfied simultaneously. If parking is cheap and convenient, it will not be plentiful. If parking is cheap and plentiful, it will not be convenient. If parking is convenient and plentiful, it will not be cheap. The University of Utah has many visitors coming to campus daily. The bookstore, the library, colleges and departments, etc. can offer validations to visitors, so that they don’t have to pay in the pay lots. (Those entities are able to purchase validations from Commuter Services for $0.75 each.) The problem is that since parking in pay lots is cheap and convenient for students and employees, it cannot be plentiful for visitors. The goal we are striving for is to have convenient and plentiful parking for visitors, which means that it cannot be cheap for students and employees. The proposal is detailed in the PDF below, which is not yet set in stone. Of course the University of Utah continues to offer the UCard, which gives virtually all students and employees unlimited rides on the buses (except for ski buses), TRAX light rail, and FrontRunner commuter rail of the Utah Transit Authority. This entry was posted in Land Use, New Urbanism, Transportation on July 23, 2013 by Mike Christensen. Last Friday afternoon, I had the pleasure of visiting the Golden Spike National Historic Site at Promontory Summit, Utah. This is the location of the completion of the Transcontinental Railroad on May 10, 1869. When the idea of a Transcontinental Railroad was first suggested by Asa Whitney in 1830, the concept must have been just as far-fetched as suggesting in 1930 that we’d be walking on the moon in 1969. Yet the vision of a Transcontinental Railroad took less than 40 years to come to fruition. So why is a nation-wide, high-speed passenger rail system such a difficult vision for people to support today? And how do we get citizens to support it? This entry was posted in Land Use, New Urbanism, Transportation on July 22, 2013 by Mike Christensen. 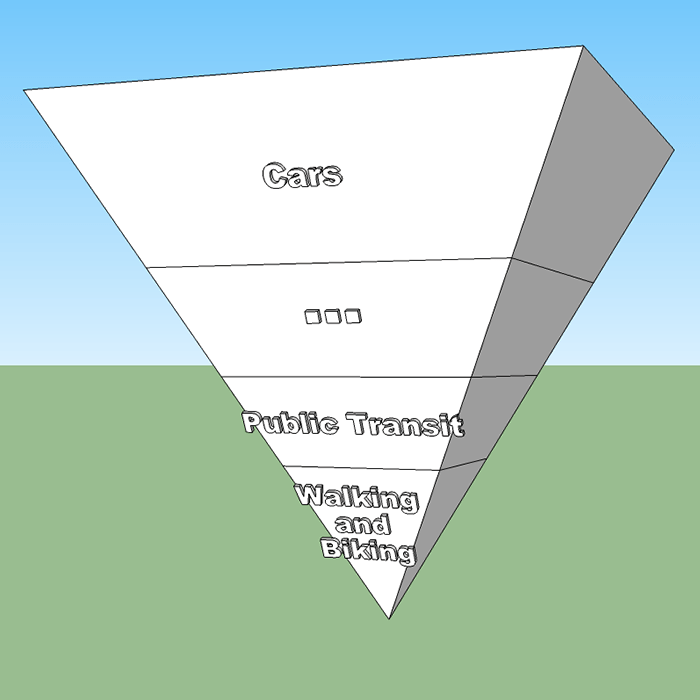 I’ve been thinking of a way to visualize how transportation modes should be prioritized. 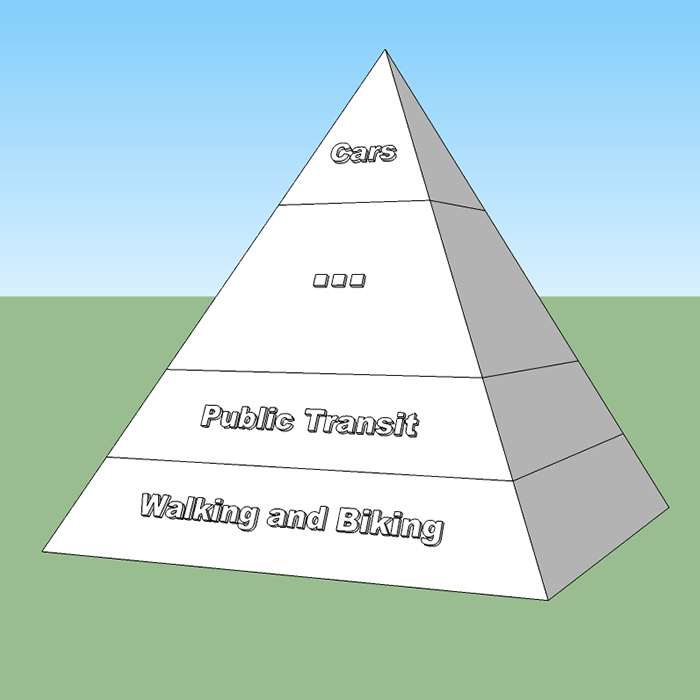 One way of looking at it is to think of a pyramid with a solid base consisting of walking and biking. Right above that comes public transit. In the middle lies everything else. And right at the top are cars. This places the most efficient transportation modes at the foundation of society’s transportation system and minimizes the role of automobiles in society. Unfortunately, sprawl necessitates that cars be given priority, while public transit and walking and biking are neglected. The question facing us is how long until the upside-down pyramid topples! This entry was posted in Land Use, New Urbanism, Transportation on July 18, 2013 by Mike Christensen. The following is an assignment for my Introduction to New Urbanism class on the Urban Transect using Salt Lake City from the northwest to downtown as a study. This entry was posted in Land Use, New Urbanism, Transportation on July 16, 2013 by Mike Christensen. 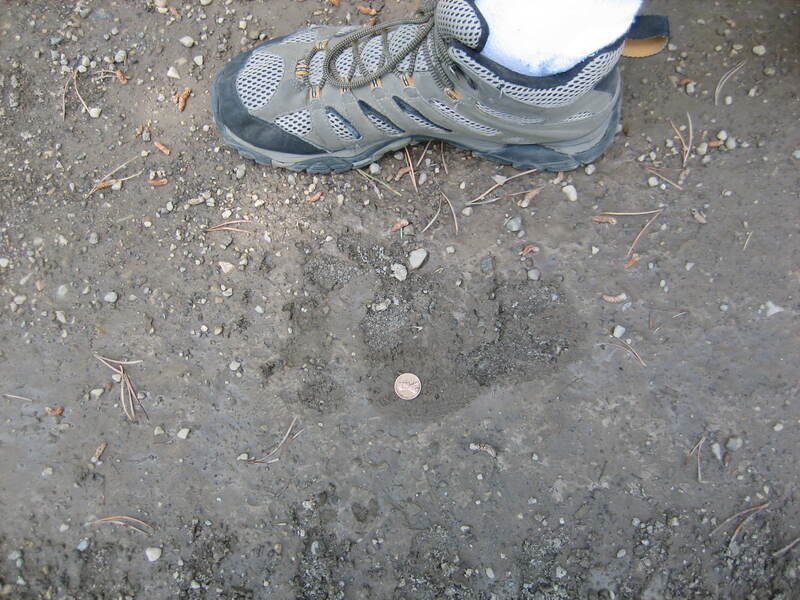 This entry was posted in Land Use, New Urbanism, Transportation on July 12, 2013 by Mike Christensen.